Bitcointalk.org, a popular forum for discussion of the virtual currency, remained offline as of Wednesday night after it was compromised. A popular Bitcoin forum, Bitcointalk.org, remained offline Wednesday night as it investigated a cyberattack. Bitcointalk.org uses forum software made by Simple Machines, a nonprofit organization. According to a video of the hack posted by a Reddit user, the attackers call themselves "The Hole Seekers." 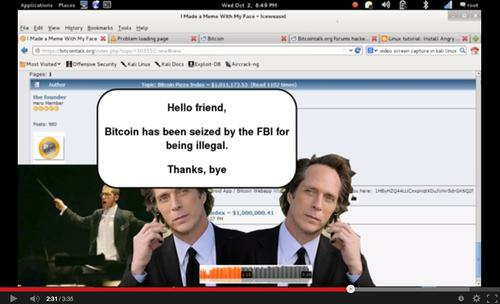 Users were greeted with classical music and animated explosions followed by the message: "Hello friend, Bitcoin has been seized by the FBI for being illegal. Thanks, bye," according to the video. The hack occurred just after the U.S. Federal Bureau of investigation seized US$3.6 million worth of the virtual currency as part of its shut down and arrest of the alleged operator of the Silk Road, an online market of mostly illicit goods. "If you used the same password on Bitcointalk.org as on other sites, you may want to change your passwords," Theymos wrote, adding that Bitcointalk.org will be offline for a while, but several people have backups of the forum. The attackers also uploaded a PHP script and other files into an avatars directory. Theymos said a 50 BTC reward, worth about $6,500, is being offered to anyone who can figure out how the site was compromised. "The forum won't go back up until I know how this was done, so it could be down for a while," Theymos wrote.